You said that our badges kept turning upside down when you wear them… so we redesigned our badges and added better fasteners. You said that Friends might forget they’d booked to attend your Session… so we added a new automatic email for your attendees 48 hours before your Session to remind them to come along. You said you wanted it to be easier to report back on your Sessions… so we reorganised the Champions dashboard to make the buttons you need easier to find and created some videos to walk you through the process. You said that you wanted an alternative to badges to give out… so we created Dementia Friends stickers that can be used for groups for whom badges aren’t appropriate. You said you needed help running Sessions for different audiences… so we’ve created guidance for children; adults with a learning disability; big groups; small groups; Black, Asian and minority ethnic communities; and more! You said you wanted to know more about local Dementia Action Alliances/Dementia Friendly Communities... so we now deliver a regular webinar to tell you more about working together and have added it to the Champions induction day. You said you found it difficult to hand out both the infocard and the action mailer in your Information Sessions… so we combined them into one action card for you to hand out (currently England only). You said you wanted to meet with other Champions in your area… so our Regional Support Officers now run 22 Champion networking meetings each month across England and Wales. 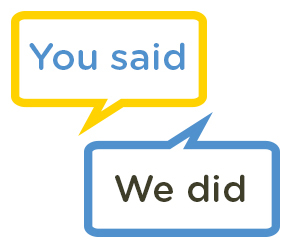 You said you wanted to run Information Sessions in other languages… so we’ve provided guidance on working with translators to keep the positive tone of your Session. You said you wanted to record your own dementia-friendly actions online like Friends do… so we updated the Champions dashboard so you can enter your actions too. This entry was posted in Champions Corner on June 6, 2016 by Dementia Friends. Can I have the details to run DF session for Cubs and scouts in my scout district. Do I they each have a badge each? Do they have a dementia activity for their unit or individual. Hi Brian – thanks for your message. All the guidance for delivering to young people, including cubs and scouts, can be found on your Champions dashboard in the Session Resources, under the tab ‘Children & Young People’. Furthermore, your Regional Support Officer Christine, is aware of your query and will be in touch. I appreciate your thanks to me for volunteering as a DF Champion but why are you hoping that I will soon run my FIRST session when I’ve been running them for over a year now??? Hi Anne – many thanks for your message. Please accept out apologies for the email you received – this was sent in error. We are absolutely aware that you have been running lots of Information Sessions since you were trained back in 2014 and are really appreciative of all you have been doing to help communities become more dementia-friendly. Sorry again for this error. Hi Emma – many thanks for your message. I have passed your query over to your Regional Support Officer, Keeley Waldron, who will be in touch shortly to help.